Die EingThe input windows for the scaling are called up via the button "Scaling" in the main window "Configuration". 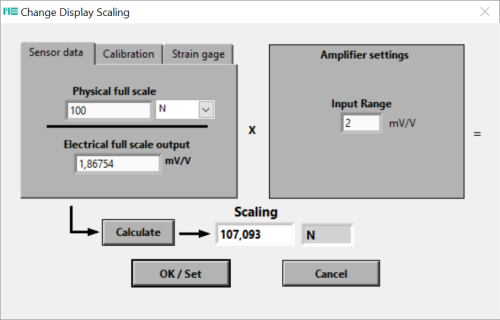 A scaling factor of 107.093 [N/2 mV/V] is obtained for the amplifier with an input sensitivity of 2 mV/V for a sensor with a nominal force of 100 N and a characteristic value of 1.86754 mV/V (characteristic value = output signal for nominal force at 1V bridge supply voltage). 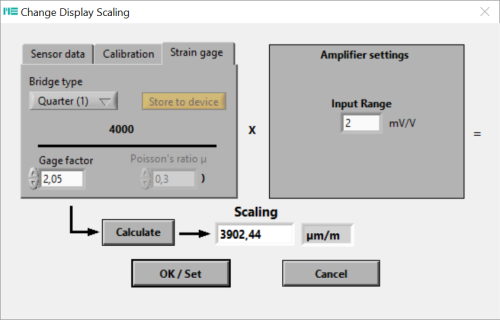 Only the resulting scaling factor is stored in the measuring amplifier. At the end of the calibration process, press "OK / Set". 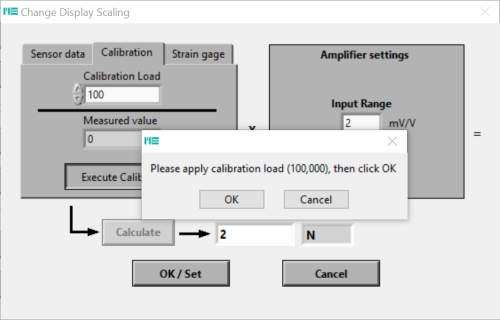 Only the resulting scaling factor is stored in the measuring amplifier. 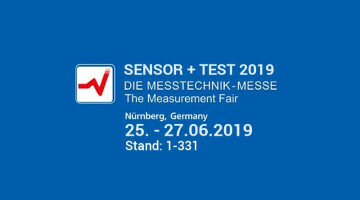 By entering the bridge type, the k-factor and, if necessary, the cross-contraction number, the scaling factor for the display of the strain is calculated in μm/m.